This beautiful remarque was hand drawn in the lower border by William S. Phillips in 1990, making this artist's proof a one-of-a-kind! Artist's Proof #29 of 50 from a sold out 1985 publication. 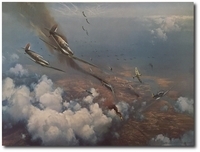 Overall size: 20" x 34 1/2"
This painting depicts the staggering beauty of Crater Lake, Oregon as seen from the cockpit of an F-4 flying the "slot position". The dazzling white snow makes the blue water seem even bluer than usual. 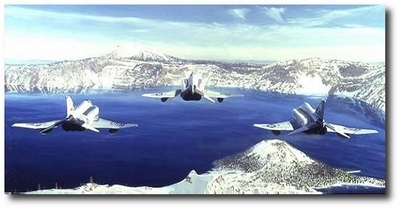 These members of the Oregon Air National Guard are flying over Wizard Island, which is afloat in the volcanic lake, enroute to Kingsley Field for routine training. Bill Phillips applied a hand-drawn remarque on the lower right-hand border, making this not only a rare artist's proof, but one which includes a one-of-a-kind piece of original artwork.